This is a perfect gift for the person that can never have too many lip balms! 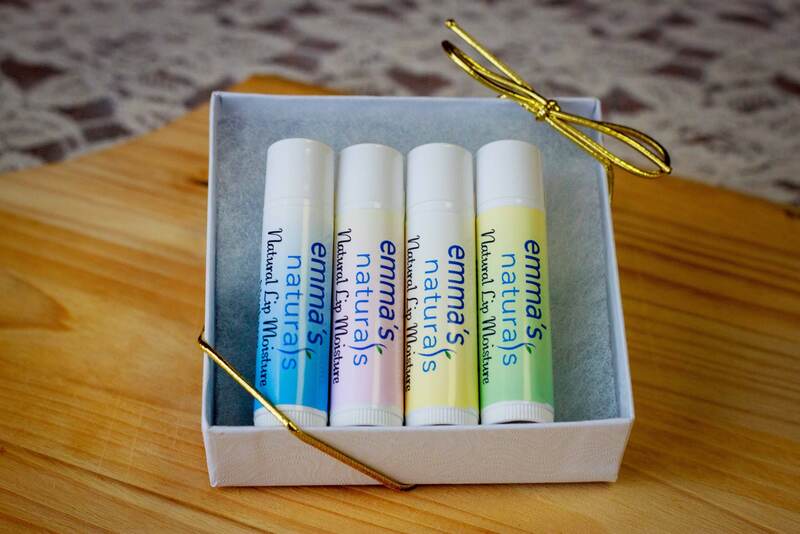 Each box includes your choice of 4 all natural lip moistures, the same great lip moistures that work to protect and moisturize your lips without all the preseratives and parabens. Try these with the Lip Mask for a truly unique lip softening experience. Due to a lack of variations please send me the remaining 2 lip moisture choices in the special message box provided. Lip Moisture choices: Vanilla, Peppermint, Creamy Coconut, Coconut Lemongrass, Blueberry, Flavor Free, and Strawberry Mint. 5 SIMPLE INGREDIENTS: Organic unrefined coconut oil, organic pure sweet almond oil, shea butter, beeswax, Non GMO unrefined vitamin e oil. You can either keep it flavor free or add one of our flavor oils.